The right cooking tools can make all the difference when it comes to preparing French cuisine, or any food for that matter. 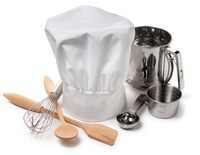 Even with a small budget, you should try to build up a base of high quality utensils. It will make your time spent in the kitchen so much more enjoyable. "Good equipment which will last for years does not seem outrageously expensive when you realize that a big, enamled-iron casserole costs no more that a 6-rib roast . . ."
Most French recipes require no special equipment beyond what you will find in most modern kitchens these days. Here is a list of a few specialized cooking tools that you are likely to find in a French kitchen, but none are really essential. Autocuiseur - A pressure cooker makes frequent appearances in French recipes for home cooks. Many times you can make the same thing without the cooker - it just takes longer. Balance Ménagère - A kitchen scale quickly becomes essential once you start using it. Cooking by weights is so much more accurate than by volumes. Friteuse - An electric deep fat fryer is great to have if you make a lot of frites. Otherwise a sturdy pot on the stove works as well. Chinois - This is a sort of very fine meshed sieve that you force liquids through to create smooth sauces. Mandoline - Learning to use one of these very sharp slicing tools can be a hazardous experience. Many times a food processor can do the same work. Poissonnière - For the home chef who has everything. A special dish just for cooking fish. Moulin à Legumes - This rotary mill can be used to make great mashed potatoes, but also to create smooth sauces and purees from just about any fruit or vegetable. Don't know where to begin? Check out this complete list of kitchen utensils and French cookware to find out what typically might equip a kitchen in France. This is one item you will find in almost all French kitchens. You may be surprised to find out how quickly and conveniently an electric teakettle boils water. Indispensable! Save time preparing French fries and other potato recipes by choosing the right cooking tools for the job. Choose between plastic, solid metal, or mandoline slicers. This is a great way to get a European style coffee without a lot of fuss or expense. You can find smaller pots that are designed for travelers. Je l'aime! Although we don't use a lot of garlic in French recipes, we do use some. Having the right tools for working with garlic makes it much more fun and less of a chore. Makes perfect mashed potatoes every time! This multi functional kitchen utensil can be used to make sauces, soups, and so much more. You may not realize you even need one until you get your hands on it.